2016 Reading #1: Magician’s Nephew by C. S. Lewis – It's Time to Read! On a daring quest to save a life, two friends are hurled into another world, where an evil sorceress seeks to enslave them. But then the lion Aslan’s song weaves itself into the fabric of a new land, a land that will be known as Narnia. And in Narnia, all things are possible. 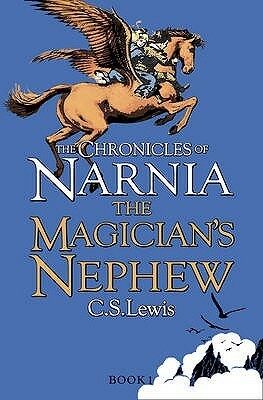 This is the first book in the wonderful Chronicles of Narnia series, written by C. S. Lewis. It is the second time I have read this book as an adult – although I remember having this collection of stories growing up so I must have read them as a child too. My review of this book, from 2008, is here. I loved this book. We meet Aslan, and we see Narnia created. I was enjoying the story up to that point, but as soon as we met Aslan and he sang Narnia into being, the beginning of the book was basically forgotten for me! It is beautiful. One of my friends said that is her favourite chapter of all time, and it is easy to see why. The magic and the wonder are breath taking. This series of books is meant for children, but they are wonderful reads. I was drawn in, and transported into those other worlds with ease and enjoyment. Like a lot of people, I know the story of The Lion, The Witch and The Wardrobe really well, and this novel, The Magician’s Nephew, gives us a lot of background information and ties very neatly into the series. It is in this book we learn about The Witch – an evil, angry, proud woman who just wants power and minions; we discover how the lamp post arrives in Narnia; and how the wardrobe becomes the entrance into Narnia. As when I last read this book, my favourite character is Aslan. He is fierce, yet gentle. He is powerful, yet so caring. When he was talking to Digory, who was sad that his mother was so ill, Aslan was compassionate and kind. The character of Aslan is based on God – our Heavenly Father – and it was an amazing read, and a great reminder of who God is, and what His character is like. I loved this book. It was an easy read, but so enjoyable. I can’t recommend it enough. The highlight for me was the creation of Narnia – its just a shame that the Witch and Uncle Andrew had to feature at that point! I am rating this book 4 out of 5, and cannot wait to read The Lion, The Witch and The Wardrobe.